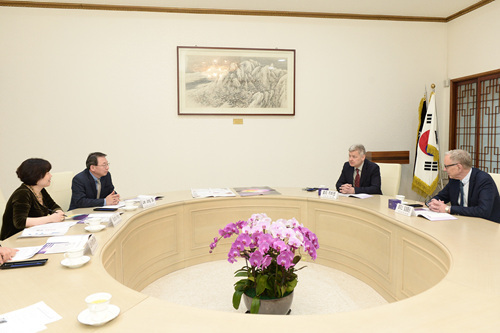 KBS Executive Vice President Lee Jong-ok(the third from left) poses with Yle visitors at KBS. KBS executives meet with heads of Yle at KBS. A high-profile visit to KBS by the Finish Broadcasting Company(Yle) has served as an opportunity for KBS and Yle to reaffirm their strong commitment to mutual co-operation for the upcoming Public Broadcasters International conferences in 2018 and 2019. KBS is hosting the annual gathering of the PBI from 23 to 25 of October this year while Yle will bring the PBI Conference to Finland in 2019. KBS welcomed a visit to KBS Headquarters by heads of Yle on February 19, 2018. 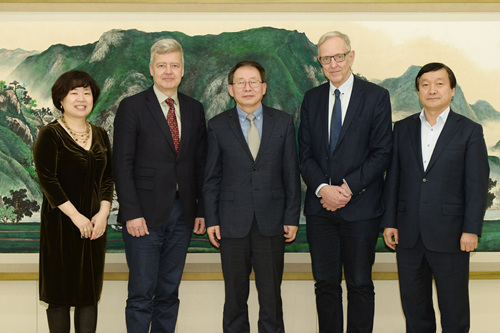 KBS Executive Vice President Lee Jong-ok cordially received Yle CEO Lauri Kivinen and Chairman of the Yle Board Thomas Wilhelmsson, and shared KBS’ plans for this year’s PBI event with the visitors from Finland as they’re also preparing to host the annual PBI meeting in 2019. Mr. Lauri Kivinen said KBS and Yle should be able to enhance the relationship between the two broadcasters through the annual forum for public service media across the globe. Mr. Lee Jong-ok agreed that KBS and Yle have much to exchange, especially through the PBI event and encouraged Yle to continue its support to the PBI Seoul 2018. 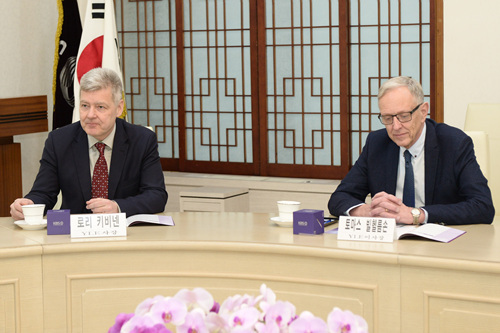 In a meeting with KBS executives, the delegation from the national public service broadcasting company of Finland also showed strong interest in the strategic initiatives being developed by KBS, particularly in the area of broadcast technology. Mr. Lauri Kivinen stressed that Mobile has emerged as a competitive media platform while communication technologies are now moving beyond 4G as well as 5G. As part of the visit to KBS, the Yle visitors were offered a guided tour of major production facilities of KBS including the news center.